On this day honoring Dr. Martin Luther King Jr., I want to remind everyone to go see Selma. This film by Ava DuVernay has generated much acclaim and has been nominated for an academy award for best picture. It’s a powerful film about people struggling, demanding to be treated with respect and to be given the full power of citizens of a liberal democracy, including not just the right, but more practically the ability to register and to vote. While I am not a King scholar and my work (not focused primarily on context of the United States) often critically reflects on the taken-for-granted presuppositions of human rights discourse and liberalism, this film is a forceful reminder that injustice is very real and justice is worth fighting for. Once of the aspects of the film that I found to be so important were the strategic decisions in the campaign. So often non-violence is seen as a benevolent choice, certainly people like me with privilege (and in the movie the president stands in defense of these interests) are calmed by the idea that we won’t be terrorized, targets of attacks of terror. But, Selma showed that rather than (or at least in addition to) a choice meant to soothe others, or even a foundational ideal, non-violence was strategic. Many thinkers remind us (who have the privilege of not being confronted with violence) that for many absence of violence is not a choice. For instance, Miguel de la Torre reminds us in Doing Christian Ethics from the Margins, “[W]hile those of the dominant culture continue to struggle with the issue of whether violence can be ethically employed, for the marginalized violence is a reality.” (109) He refers here to the fact that many live with violence or at least the real threat of violence. Massive protests in Ferguson, Missouri this past year spotlighted the reality of police violence that many people live with in the U.S.
Selma emphasized the strategic calculation of not responding with violence even when peaceful protests were met with police brutality. We can’t win that way, one of the organizers in the film explained to another who sought justice in kind. The relevance of the film, the relevance of the struggle and the treatment those assembled faced was striking. So many cases of violence against unarmed black men have been world-wide news (e.g. Michael Brown in Ferguson, Missouri; Eric Garner in New York, Trayvon Martin in Sanford, Florida) For each of these, presumably there are many, many more that go unnoticed or unreported. The film ends with an original song, Glory, by John Legend and Common. This song so powerfully asserts with its words and music, that the struggle is not over but continues a fight for glory. Perhaps this sentiment helps me deal with the distance between my current project and the important fight for justice gestured to in the film and song. An assertion ‘justice for all’ falls lightly and simply tend to soothe us as we continue to implicitly support the status quo. We need to get specific, asking important questions in each of our particular contexts. How do people thrive? What are the specific struggles? What is your place and what is my place in these? I’ll leave you with a link to the tremendously moving song Glory. Listen now. Go see Selma and be sure to sit through the credits to listen to it in the theatre. And, perhaps later, listen again, to remind you of the power of the film and the power of the music and the power and importance of the ongoing struggle. I happened to be at my parents’ house when the attack on Charlie Hebdo occurred. This meant I saw TV news portrayal of the events that I normally would not have seen as they regularly watch the nightly news and both the attacks, the “manhunt” for the gunmen, and the gatherings of people with their signs “Je suis Charlie” were the top news stories for several days. I was struck by the news coverage and by the outpouring of people whose response was to identify with the satirical publication in defense of liberty and free speech. It took several days to be able to articulate the problems I was struggling with. The main problem I felt was how the whole thing was being framed. The news reported that all these people had come together in France and even in the U.S. in solidarity to publicly express they would stubbornly claim their right to free speech, unafraid in spite of the terror the attacks were possibly meant to incite. Part of the problem, for me, is the monopoly on what it means to be human. To be human for those who gathered was to have free speech—which may offend, belittle, insult, and may reinforce or spawn a low opinion of certain persons or groups of people. This understanding of what it means to be human seems so small and inadequate. The fact that the news showed hundreds or thousands of people coming together to claim ‘I am Charlie’ and proclaiming their liberty implies that in order to be human they should (like Charlie) be allowed to and protected in saying whatever they want at whomever’s expense. There are other ways of understanding self which do not fit nicely into the broader discourse of liberal democracy and the sacredness of freedom of speech. In a set of papers (published in Is Critique Secular? Blasphemy, Injury, and Free Speech) which address the 2005 Dutch newspaper’s publication of a satirical cartoon of the Prophet Muhammad and the framing of the issues, Talal Asad recounts how actually upholding the moral order and belonging to a community has been seen by some as more important than protecting personal property (including the personal property of the body and—I would add—associated personal freedom of speech). In this scenario, one follows more rules of comportment and so has less freedom in order to be in the community which is makes one fully human. The overwhelming outcry of supporters portrayed on the news seemed to convey the message ‘free speech = human’ keeps such alternatives invisible and obscures the contingency in the system which ostensibly protects freedom above all else. As an aside, I find this insight useful in my analysis of data from my fieldwork in Cambodia in which freedom does not seem to be the top priority for empowered women. I don’t mean here to suggest one understanding is better than the other but merely to hint at the possibility that there is more than one functional understanding of what it means to be human. Second, despite the rhetoric of those shown on the news, I wonder if freedom of speech is really what’s at stake here. It’s not as though the government is censoring the publication. There is not an all-powerful structure (like a military-backed government) that is keeping the newspaper in check. It seems that the killings were not as much an attack on freedom of the press but an act of terror, a retaliation to the terror that the images likely caused. This interpretation is not by at all meant to condone the shooting but just an attempt at understanding the event. The deplorable shooting may seem to simply be an attempt to thwart printing of insulting images. In fact, the masterminds of this attack may have been doing just this. But actually, it’s as likely a response to an entire structure of terror that those who orchestrated and those who carried out the shootings have experienced. The satirical, offensive cartoons may be just a tiny part of this larger structure of terror. Others have pointed to the type of lives the two gunmen lived. In his article “Moral Clarify,” Adam Shatz writes, “They were, above all, beurs, French citizens from the banlieue: Parisians of North African descent.” He interprets their actions this way: “Radical Islam gave them the sense of purpose that they couldn’t otherwise find in France. It allowed them to translate their sense of powerlessness into total power, their aimlessness into heroism on the stage of history.” What I mean to suggest is that if the context is so suffocating for people in the shooters’ shoes, they may be fighting against the whole suffocating structure. And perhaps the satirical publication functions to keep other parts of the structure in place, ostensibly upholding the right to freedom of the press but actually upholding much more in terms of who has power and opportunity. If this was an act of terror in retaliation of what they experienced as terror, a response partly facilitated by the attackers’ newfound a way of understanding the world and what it means to be human, then we should think carefully and critically at both the monopoly on the rhetoric of how society is to be structured and what it means to be human and even more importantly the actual status quo of life it supports. Who has which opportunities and who faces which challenges in this status quo? I realize there are countess factors to consider. Is there any functional political system in which contradictory understandings of what it means to be human can coexist? Aren’t whistleblowers also actually acting in their use of speech? In a similar way almost every claim I’ve made above can be analyzed, questioned, and complicated further and yet these claims expresses why I feel queasy: There’s an unacknowledged monopoly on what it means to be human which might not be equally good for everyone and free speech does not really seem to be what the outpouring is about. The struggle, for me at least, is to continue to try to be critical of all-encompassing frameworks, to recognize the limitations and contingencies of these, and also to look at what kind of status quo, not just the rhetoric but the possibilities and impossibilities in society, are being plainly or surreptitiously upheld by the rhetoric. On Elections–What does it mean? What will it change? As a resident of Phnom Penh, a researcher in religion and feminism, not a scholar of political science, and with just a basic understanding of Cambodia’s political history, I’d like to explain to others who know even less than the little that I know about last week’s election and its significance. On July 28, the Cambodian people went to the polls to vote in the national election. The current ruling party, Cambodian People’s Party (CPP), is a descendant of the Kampuchean People’s Revolutionary Party which was the sole political party after the fall of the Khmer Rouge to the Vietnamese. Since the first UN-monitored election in 1993, in which a coalition government with the royal party FUNCIPEC, the CPP appears to have pretty steadily increased its power. But this year something dramatically different has happened. The CPP Information Minister unofficially announced on his Facebook page on the night of the election that the CPP had retained only 68 seats and the opposition, the Cambodian National Rescue Party (CNRP) had 55 seats whereas previously the CPP had 90 out of the 123 seats. This CPP-reported result differs from the results that the CNRP has reported, in which they say they won the elections by a count of 63 to 60. The official election body, the National Election Committee (NEC) whose impartiality has been questioned, has not given even a preliminary result (scheduled to be released on August 10) and there are reports of voter irregularities (people turned up and their name was not on the list or people came to vote and a vote has already been made in their name, for example). But still, while we wait to see how various players respond and what the outcome is, one thing is for sure, something unexpected and dramatic has taken place. Even if the CPP-reported result and even with reports of irregularities, we can see that support for the ruling party, or at least its performance, has weakened. 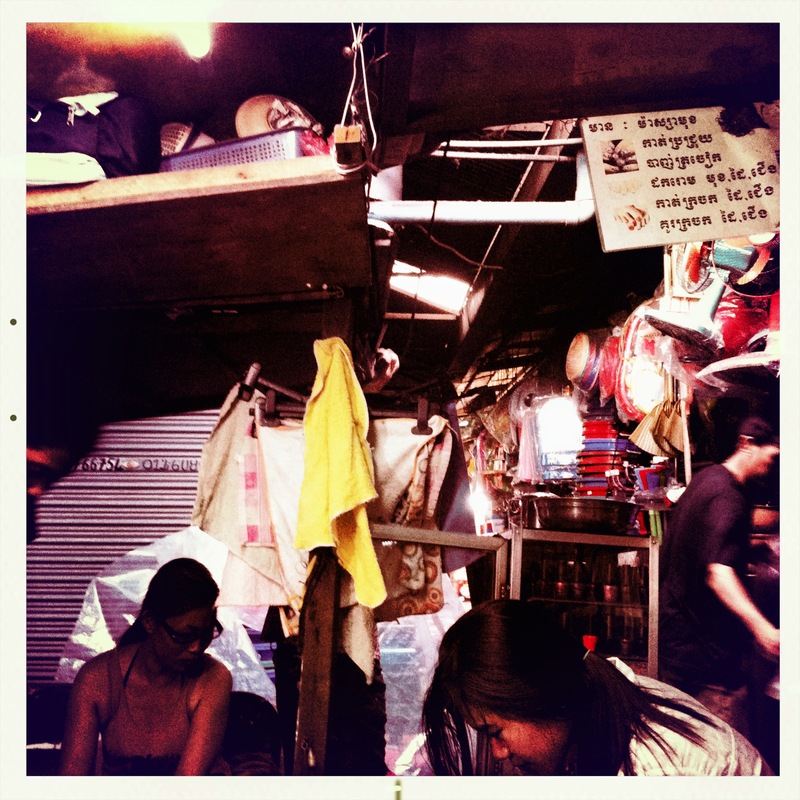 Different friends in Cambodia have different analyzes and explanations for what has happened. Some say that the ruling party has gone too far in making economic concessions which leave people landless or displaced from their income-generating activities. Or perhaps corruption has become too blatant and effects people’s lives so that they can’t get ID cards or passports because it’s just too expensive. Lives are too negatively affected and people are looking for a change. Others note that the biggest difference they observed in this election is that the people no longer appear to be afraid to stand up and oppose the ruling party. During the campaign people paraded in the streets shouting Change! (the current regime) and were not violently suppressed. On election day, at least in one location, instead of the CPP supporters hanging around and bringing people to vote, intimidating anyone who was not a party supporter, the opposite occurred. People questioned outsiders–people who were not from the village but who had come to vote here, not wanting their votes to be undone by such unfair tactics. We cannot know what will change due to this surprise result. Most everyone I have spoken with about the election, Cambodian and foreigner alike, was not expecting anything like this. Some say the prime minister will have to behave differently. Others say that the CPP will break their unity of the opposition, incorporating some of the opposition lawmakers, thereby dismantling it. In recent reports, the prime minister has allegedly given two possible scenarios both of which keep the CPP in control. The CNRP has called for a full review and investigation that includes representatives from both parties and the UN. If the government does not made a good faith effort to investigate irregularities, there may be demonstrations by those who were so brave in choosing not to support the ruling party. We cannot know what the political result will be but we can see that in Cambodia something appears to be changing. For this reason alone, these are exciting and unprecedented times. 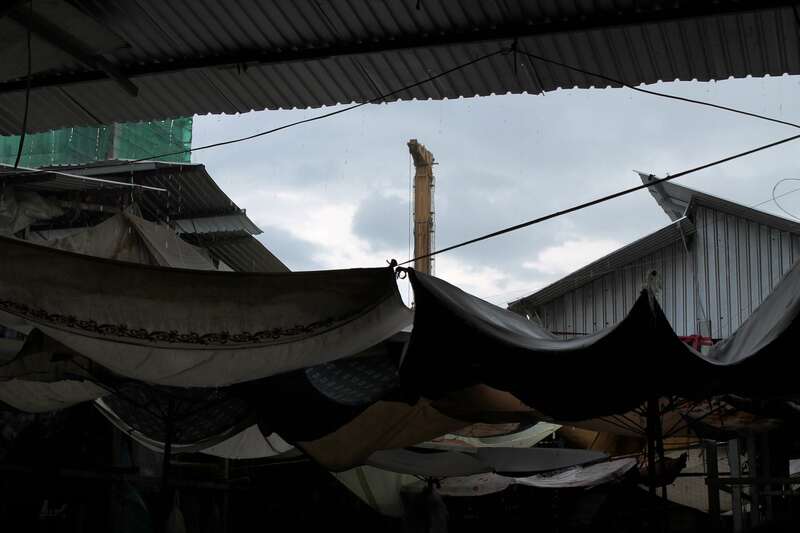 If you’re interested in following this story as it unfolds, I’d recommend checking out the English-language version of the newspaper, The Cambodia Daily. As I biked on one of the main roads to the office, I noticed a lot of small flags, Cambodian flags and political party flags fixed to every construction fence and to light posts, party banners stapled to trees and wooden poles. At the first stop light, I was next to a man dressed in a buttoned down shirt riding a modto. On the back of his helmet a political party logo sticker. The campaign must have officially began. Officially, the campaign is only a month long, starting June 28 and ending on election day, July 28. 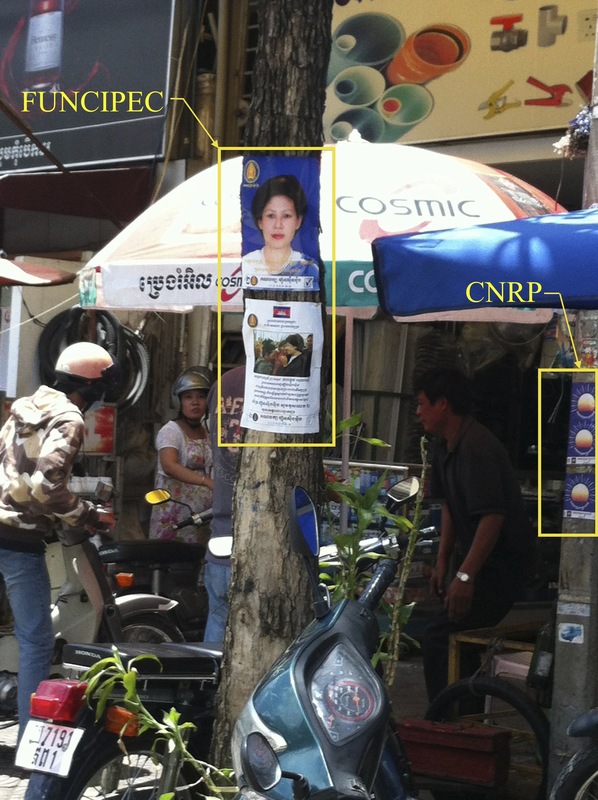 To say the campaigning is noticeable, at least in Phnom Penh, is an understatement. Various parties, primarily the ruling party and the “opposition,” decorate tuk tuks and cars and equip them with loudspeakers, which go down various city street usually blasting music, perhaps political songs, that can’t be missed. Plus, people stick their favorite party’s logo everywhere. Large political party logos on SUVs are not uncommon and I’ve seen several people even putting them on their modto helmets. When I was down by the riverside one evening on the weekend, I saw a big commotion. It was a parade, a CPP parade, with cars with banners, and trucks decked out, loud music blaring, with people dancing in the back, everyone sporting political party shirts and caps. I knew this took place on the first day of the campaign but I was puzzled that it was going on again. People shouted their support, delighted to celebrate the parading, and join in the celebratory spirit. I asked someone if this was something that happened every day? Yes. Wow. 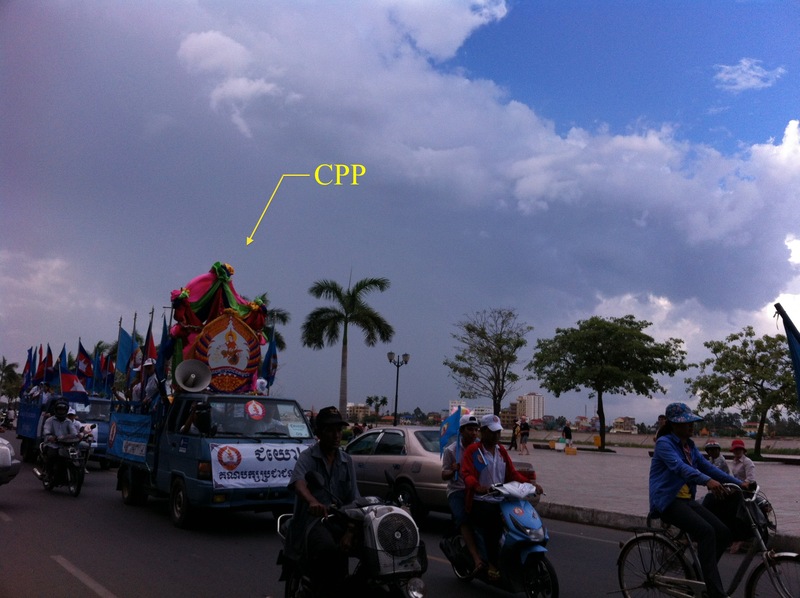 Then a little while later I saw a similar parade going the other direction, a CNRP parade. I was at a different shop and again asked if this was an everyday occurrence. Two parades everyday? Yes, he said, every day for 31 days. 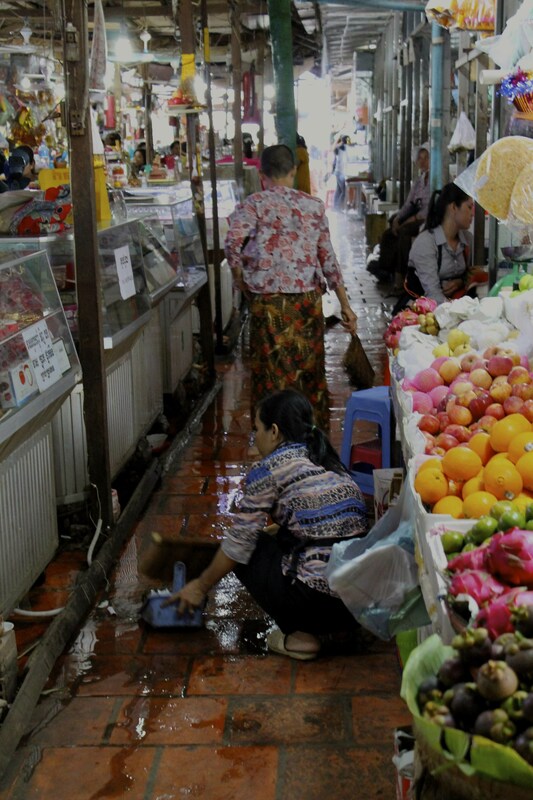 Not too long ago, while I was in the market doing some shopping, the rain started. It got really loud. Water started dribbling and at some places pouring down where various roofs came together or where the roof was a less tightly woven tarp and it leaked out. I waited for a bit and then went over to the dessert lady and had a pumpkin custard slice and waited some more. That’s what I’ve learned that you do (in Cambodia) when it rains. You don’t try to fight it. You wait until it’s done. Then it started pouring. Pretty soon a guy (police?) with a uniform and a rifle slung across his back started hastily doing something with the water. I thought it was probably flooding. He was sort of holding the front of his gun with one hand (so as to keep from accidentally shooting us?) as he was squatting down and excitedly doing something with the at ground level. When the woman who sold desserts got into it too, I saw what they were doing–sweeping the water. Sweeping, sweeping. Was it a flood? 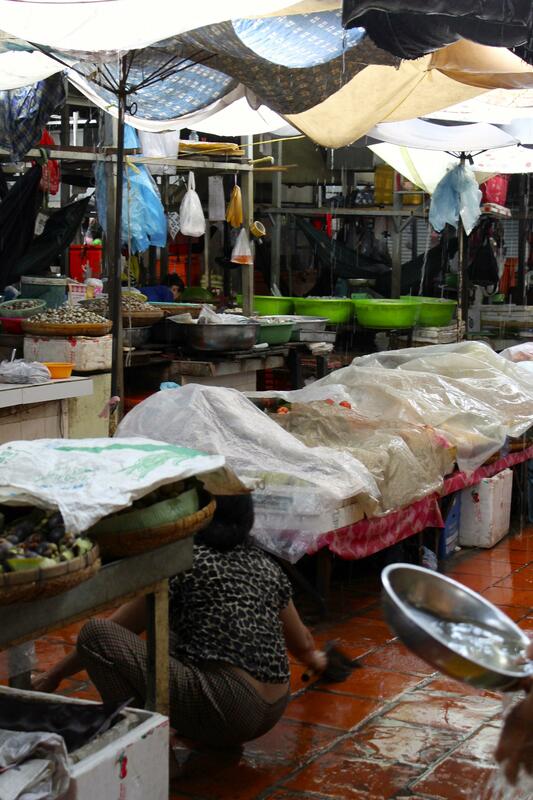 One seller quickly covered the clothes with plastic and the sweets seller keep sweeping. I decided to leave and mosey to a different direction to be out of this commotion. As I left, I saw the seller pouring what looked like comet on the tiled floor. The frantic action, the seeming panic, was all about cleaning?? And as I went out to the area where I parked my bike to go to my next destination what did I see? A man cleaning his motdo. That settles it: good rainstorm = time to clean. Noted. The United States is deeply concerned by reports that the Permanent Committee of the Cambodian National Assembly, made up entirely of members of the ruling party, has expelled opposition lawmakers from the National Assembly. Such a decision starkly contradicts the spirit of a healthy democratic process. We strongly support a political process that includes the full participation of all political parties on a level playing field. Stripping the salaries and parliamentary status of opposition party legislators deprives the Cambodian people of their voice and hurts the democratic process in Cambodia. Full participation of all elected representatives is essential to the democratic process. We urge the National Assembly leadership to allow all elected members to fulfill their commitment to serve the Cambodian people. While I’m admittedly not an expert in international politics, I want to explore what I think is an important question: Is this a “colonial” move by the U.S.? My first reaction is: Not in the slightest. I was under the impression that having opinions and issuing statements about other countries’ actions is part of participating in the international community. Colonialism generally refers to an actual administrative power in the governing of another country. Hence, the French Protectorate would be a time of colonialism. The Vietnamese occupation as well. Neocolonialism is generally understand as the transition from the direct control by another country to establishment (or maintenance) of elites that hold favor with a country which is able to, through these people, control the country, continuing an exploitative relationship with its people. Imperialism, probably the most relevant in the relationship between the U.S. and Cambodia, is the ability for a strong (usually economically strong) power to control another country through economic dependence which includes cultural imperialism. This would include teaching or somehow spreading ideas that keep one country in power, internationally speaking. Hence, selling the logic of neoliberal capitalism might be most beneficial for the U.S. or most beneficial for various transnational corporations and the executives of those. Other values which benefit one country over others might also be considered imperialism. For instance, valuing secularism over religion can politically mean vilifying religious (in the current rhetoric usually Islamic) violence and more importantly justifying secular violence (against the religious violence, for instance). This, by the way, is the main thesis of Cavanaugh’s book The Myth of Religious Violence. But let’s do a very quick and rudimentary analysis. Is the U.S. State Department’s action colonial? Since the U.S. is not directly in control of Cambodian government, perhaps we can ask a related question: Is it paternalistic? To command a change in policy or else (for instance, the “or else” might be implementing economic sanctions or using military force or instituting some other form of “punishment”) seems more paternalistic and depending on what we mean by “colonial” seems to be easier to argue for. Or for the U.S. to ignore what U.S. thinks is an unjust situation because the country is undeveloped and is unworthy of attention seems also to be paternalistic, politically ignoring the country (and perhaps working in covert ways) would also be on the scale of colonial to imperialistic. But to issue a statement using the values a country (the U.S.) claims to hold (whether this is internally consistent is a whole different, more dubious question) and make a statement regarding others’ unjust actions seems to me to be the opposite of colonial. Is making such a statement even imperialistic? This would take a lot more analysis of what democracy means (which is an important exercise). But on the surface, it seems difficult to argue it’s imperialistic. This sort of statement necessarily made from the ethical framework of one country (here, the U.S.), which seems to encourage dialogue, an attempt to hold another (here, Cambodia) accountable to its own purported values (in this case, democracy), seems to be treating another as, well, more of an equal. It doesn’t appear to be coercion, or indoctrination, or a way to reinforce exploitation which seem to be important in imperialism. In the article Mr. Vun says, “We took an oath to protect democracy, and they [the U.S.] tell Cambodia to do this and do that. We cannot accept it. If we tell [the U.S. Congress] what to do, will they do it? If not, don’t tell our National Assembly what to do.” I don’t know if this is a language issue, but it seems to me that it would be appropriate for other countries to call out the U.S. in double-talk or unjust practices. I would hope that Cambodia would make statements about injustices that it sees in the U.S. policy, for instance toward Cambodia, or even unjust practices toward its own (American) people. In fact, also in the article, Mr. Vun does call out the U.S. for its role in the 1970 coup d’etat which seems to be a normal (not colonial) thing to do. So, philosophically, I think that such a statement by the U.S. State Department whether I agree with it or not, does not seem to be “colonial.” I must admit that underneath such statements there may be a lot of other things going on. Perhaps those practices are more “colonial.” And perhaps my hope that other countries would call out the U.S. is unrealistic because of the actual imperialistic power that it holds. If so, this, then, is a problem. But as for the U.S. State Department’s statement, I so no colonialism. What do you see? Want to get your nails done? Come to Cambodia. You’ve got lots of options here. Yes, I’ve gone to the fancy spa and paid a whopping $15, went to a Christian NGO “business” (helping women by employing them to work painting nails), and even had a terrible mani-pedi at what seemed to me to be a front for some other sorts of activities (a brothel, perhaps? maybe not). But I finally had my first market manicure–or pedicure actually. I’ve always wanted to try it but haven’t seen an opening for a foreigner to jump in there. 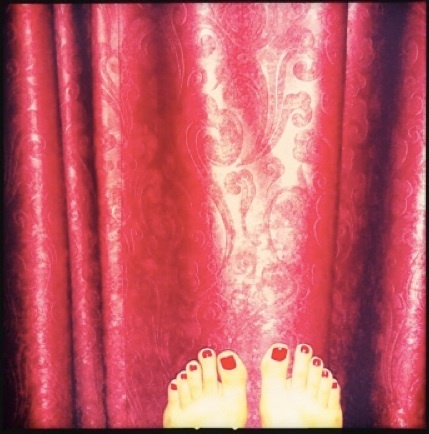 But, one day walking through the market with naked toenails, I noticed a glass cabinet with some high quality nail polish inside. I stopped and peeked inside. I scoped out the little stall with girls sitting on tiny stools and one well-to-do-looking Khmer woman getting her nails done. The old women with painted on eyebrows and thinning hair that had been dyed and was a shade of brown started talking to me. I hesitated, not immediately responding and they thought I didn’t speak Khmer. The other customer said she doesn’t know (probably how to speak Khmer). I said, I know how to. I asked how much for feet. She said 4000. Basically, a dollar. That sounded good to me. I chose my polish, a deep red, and had a seat. They prepared a small metal bowl of water (cold water) and had me soak both feet first. There were four girls–maybe in their early twenties who were the employees. The other woman was getting her fingernails done. They were painting some designs in white using a tiny brush and acrylic paint straight from the tube. It was very pretty. I commented on how pretty it was. She was a middle-aged woman, a bit chubby which meant she wasn’t having a hard time getting plenty of food (a sign of affluence) with make-up and hairsprayed hair, her hair in front pulled back but fluffed in front like my friends and I used to wear ours in the 90s. There was a fan and the old woman was boiling water (I guess) which caused some waves of heat from time to time. I was trying to figure out who owned the place and how this was working. A man came and “cleaned out” the money from the cabinet–at least that’s what it looked like. I’m not sure if he was related or an owner or if he was just collecting rent for the stall in the market. The old woman set up a hammock and sat on that, hovering just inches off the ground. After the woman next to me had her nails sealed with a clear coat, they turned the fan off. I asked if the wind was all gone. They asked if I was hot? Yes. (Absolutely!) They turned it back on which was great. I still felt the sweat dripping down my back and running below my waist line but my front was pretty cool and comfortable, considering. A foreigner woman walked by and the old woman said, “your friend.” “Don’t know her,” I replied. They were tickled that I responded in Khmer. 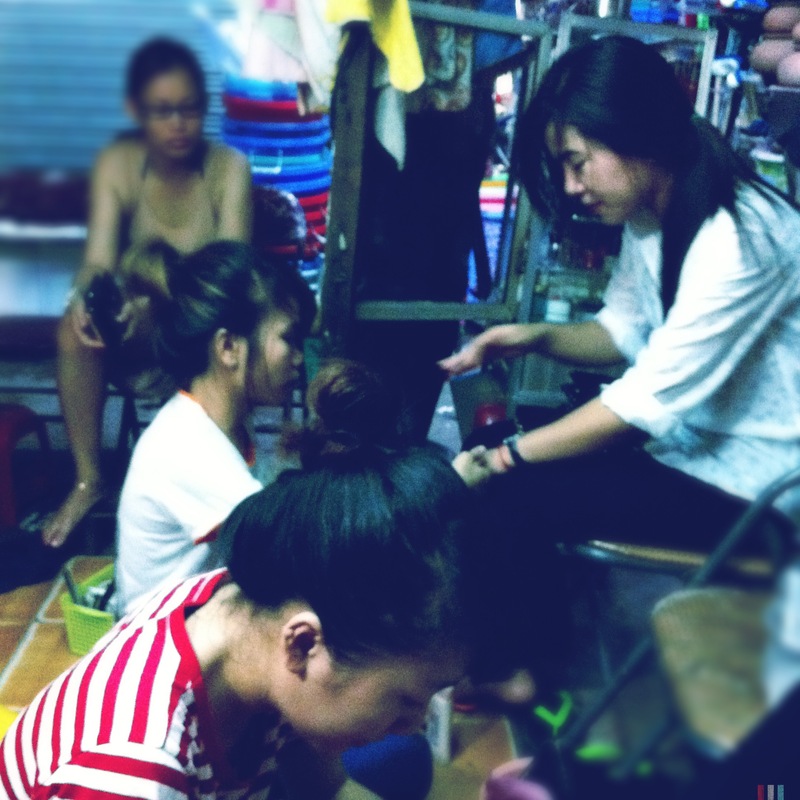 Another thin young Khmer woman came over to get her nails done. She also seemed to fit comfortably within middle class by the looks of it. The girls at this shop knew her, perhaps a regular. The pedicure itself was pretty standard and good quality. Cuticle cutters did wonders to make my feet look like they were not in sandals every day. Filing. Buffing. Base coat. Two colors coats and a top coat. Then my newly painted toes got the fan. I sat there for a bit, waiting for them to dry some and looking at the makeshift space. The “ceiling” was plastic something and the cords for the lights and other things were taped on with clear packing tape. The market “salon” really is part of a different world. After a few minutes me and my new fancy nails continued our market shopping.